Dunkirk feels like one of the most responsible war films ever made. You really do feel for the poor participants, their frustrations and fears, and the film ratchets up the tension on half a dozen occasions. A fun night out at the flicks, this ain’t. For someone who knew next to nothing about Dunkirk the event, Christopher Nolan’s film is certainly educational. To a certain extent. For all the chaos going on, there’s very little in the way of exposition. This is possibly a deliberate storytelling technique, to put us in the boots of the soldiers who knew very little aside from a sense of urgency in their efforts to escape impending death. As such, this is a war movie that’s quite distinct from your usual war movie. At best, it avoids those awkward moments where the viewer wonders if the film they’re watching is glorifying war. After all, this is about thousands of men trying their best not to die. At worst, it means that the film will be a confusing cinematic experience for some, what with the multiple concurrent timelines. In a move reminiscent of his breakthrough, Memento, Nolan plays around with beginning, middle and ending, having three separate stories happening simultaneously, even if they begin days or hours or minutes apart. The three separate stories are linear, and like Memento, the film seems more complicated than it actually is. That being said, considering everyone is wearing uniforms and boast few distinguishing features, it does get confusing. There are already multiple articles online explaining the potentially confusing timeline, though I won’t link them here for fear of spoilers. The cast are great, completely inhabiting their roles. Nolan mainstays Cillian Murphy and Tom Hardy are present (even Michael Caine appears in a voice-over!) but the film expertly obfuscates their star presence, and each become just another weary and terrified face amongst all the other men facing death. As with Interstellar, the use of visual effects here is phenomenal. It never looks anything less than photo-real, even when I’m sure I must be looking at CGI. That it was done with a relatively scant budget of only $100 million is shocking. But then again, Nolan really is an anomaly – a director that gets to work within the studio system, making blockbusters that still feel like the products of an auteur. Here, the pace never lets up, so it’s just as well the film is only 106 minutes. When there’s a tendency for successful directors to become more and more self-indulgent, this is another reason to be impressed by Nolan’s achievement. 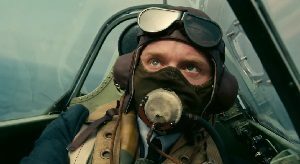 I can’t really say that Dunkirk is a fun film, hence the low Hoopla Factor. It is an incredible big screen experience, however, and really drives home the significance of the event without reaching for any cheap platitudes. This entry was posted in Film Reviews and tagged Period Drama, Thriller, War by Stuart Wilson. Bookmark the permalink.